Feeding the birds in the garden is a joy that transports many of us back to our childhood. However, supporting our garden birds is now more relevant and more important than ever. Due to urban development and a steadily declining food supply, almost half of our native bird species are considered threatened. Areas of building development now mean disappearing meadows, shrubs and trees – all vital sources of food for our wild bird population. Therefore, feeding these birds is becoming increasingly essential. By supplementing their natural food supply in all four seasons of the year, we can help to boost our native bird population. Feeding wild birds can upset their natural feeding habits, so it is very important to offer your garden birds suitable nutrition. Lillebro has a diverse range of species-appropriate foods suitable for native wild birds. With products including seed mixes, seasonal fat balls, meal worms and chopped peanuts, you can find the right food for any species of wild bird. 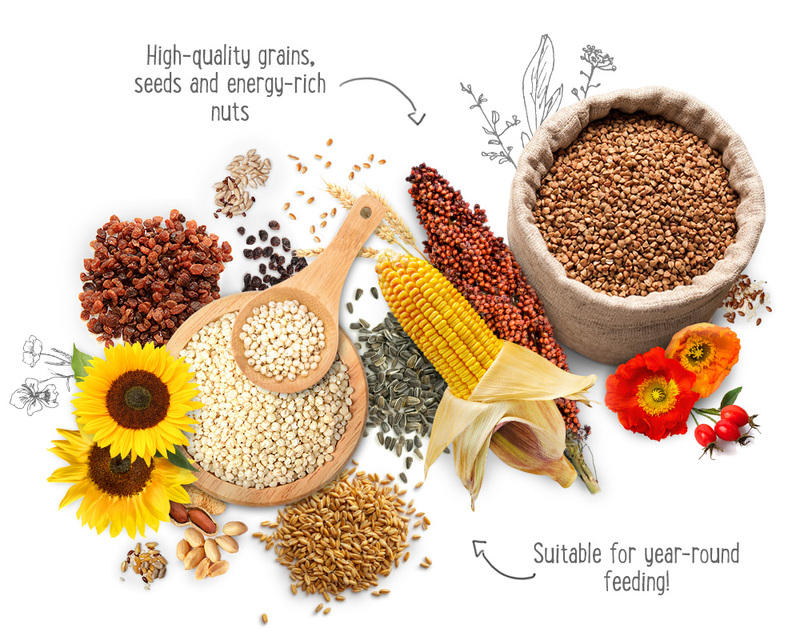 Lillebro products are rich in energy, contain plenty of vitamins and minerals and are free from ragweed seed, so you can be confident that you are supplementing the seasonal food supply for wild birds in a natural and nutritious manner. As our environment becomes increasingly urbanised, leading experts recommend feeding wild birds throughout the whole year. By feeding Lillebro products to your garden birds, you are helping to supplement their food supply in a natural and wholesome way! Lillebro understands that we all have a responsibility to protect our native birds. Lillebro’s fantastic range of nuts, seeds, grains and raisins helps you to feed wild birds in a species-appropriate way. The food requirements of wild birds vary according to species, so Lillebro provides the right food for every wild bird. Whether you are looking for fat balls or peanuts, seed mixes or sunflower seeds, Lillebro has all the products you need to support your garden birds. Every single one of our products is composed of natural, high-quality ingredients and undergoes rigorous quality checks, including testing for ragweed seed (ambrosia artemisiifolia). Support year-round wild bird feeding with Lillebro! The Lillebro range includes the following products: Lillebro Wild Bird Food, Lillebro Husk-Free Wild Bird Food, Lillebro Chopped Peanuts, Lillebro Dried Mealworms, Lillebro Sunflower Seeds for Wild Birds, Lillebro XXL Fat Balls and Lillebro Fat Balls.